I can happily report that this play is nothing like what I expected. 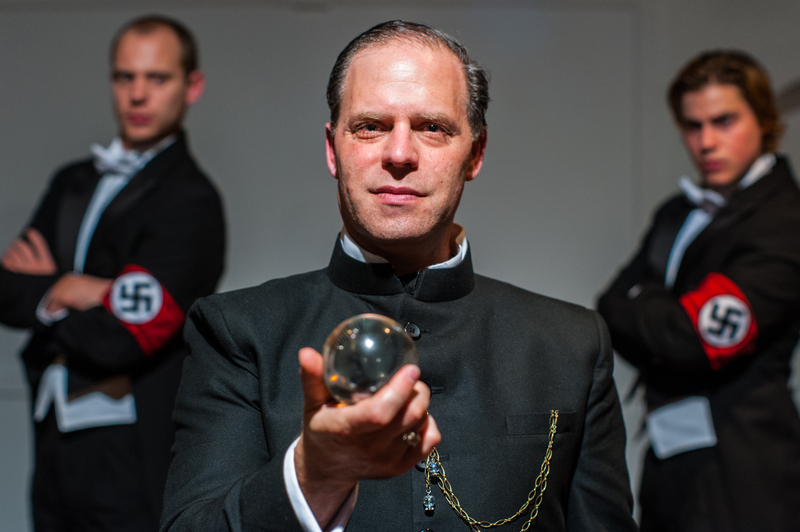 A one-man show about a member of the Nazi party who aspires to become the Third Reich’s Minister of the Occult elicits imagined plotlines ranging from depressing to morbid. Instead, Neil Tobin’s “Palace of the Occult” is a fascinating examination of real-life Austrian/Czech Jewish performer Erik Jan Hanussen, an early advisor to Adolf Hitler. Tobin performs his opus under the direction of David Belew. The resulting production has the air of a comfortable chat among friends with some stellar magic tricks worked in. The legerdemain is the hidden point of the play. Naturally, when telling the tale of an illusionist, mentalist, and supposed psychic, you must incorporate the acts themselves into the show. Unlike more common magic shows, this production is slow-paced, lulling the audience into accepting the illusions as a natural part of the world of this performer who is open with many of his secrets, but still won’t reveal how he does any of his tricks. All the rest of Hanussen’s act is laid bare by Tobin, however. He provides insight into the reasoning behind his stage name and the deviousness that led to his involvement with the Nazis. He outlines the path he took to cultivate a friendship with the future leader of Germany in order to advance his career and elevate himself politically into a position within the country’s cabinet, despite his being of Jewish birth. Eclectic Full Contact Theater at Prop Thtr, 3502 North Elston, (800)838-3006, eclectic-theatre.com, $30-$35. Through December 20.